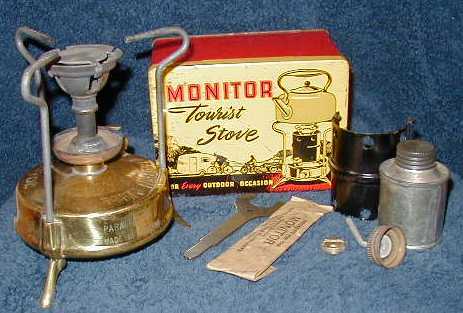 Featured stove, the Monitor 'Tourist', some pictures for you to browse. The overall condition of this Monitor 17b 'Tourist Stove' bears testament to the care and respect it's owner gave it over the years. 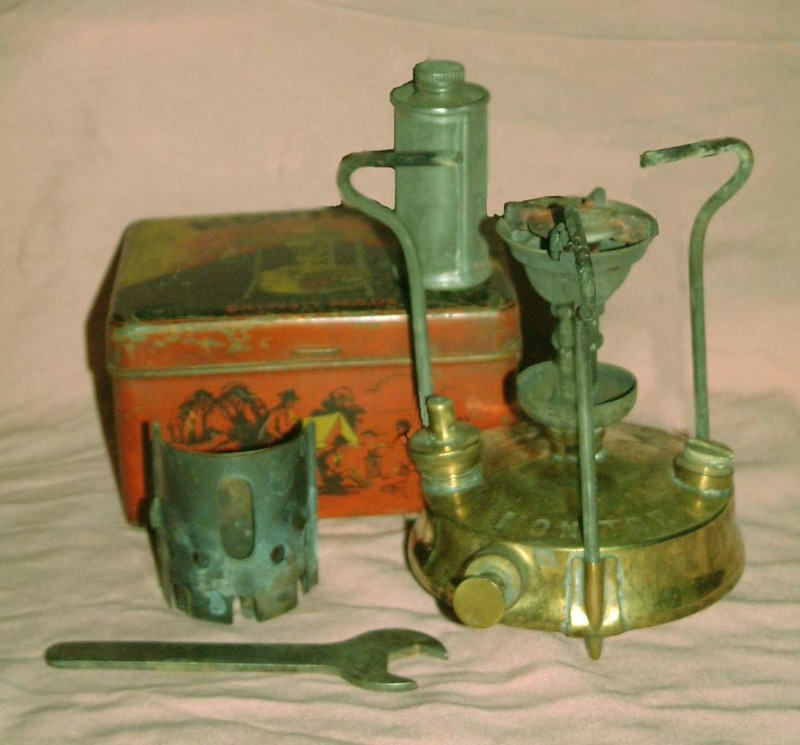 The un-restored stove is complete with spirit can, windshield, spanner, instructions and printed tin. What is unusual about this example is we have some details of it's history which really brings this proud stove to life..! The stove was purchased in the late 1920's by Mr. K. Arthur in the South of England. A keen cyclist, Mr. Arthur used the stove for cycle trips through the English countryside. Later in the early 1930's Mr. Arthur's job with the Post Office enabled him to buy a Morris 8 car and the trusty 17b served to brew tea on Mr. & Mrs. Arthur's regular outings. A son, Roy, was born in the early 1930's and he remembered well the boring, ritual roadside stops to assemble the stove, prime & pump to bring the picnic kettle to the boil..! An epic 2 day trip from Sussex to Cornwall on the roads of the time was an adventure in itself..! Wartime meant the Morris 8 car was stored with it's axles up on bricks and the 17b stove safe in the boot. After the War both the car and the stove were brought back into regular use by the family. By the early 1960's the car, the stove and Mr. Arthur were all becoming tired. Sadly Mr. Arthur died in 1975 and the stove eventually passed to Roy Arthur his son. Roy presented the stove to our archive in 2004 to be kept in memory of his father and the long service it gave. Roy himself died in his sleep in March 2006, a kind and meticulous man, this pretty stove remains a testament to both him and his father. 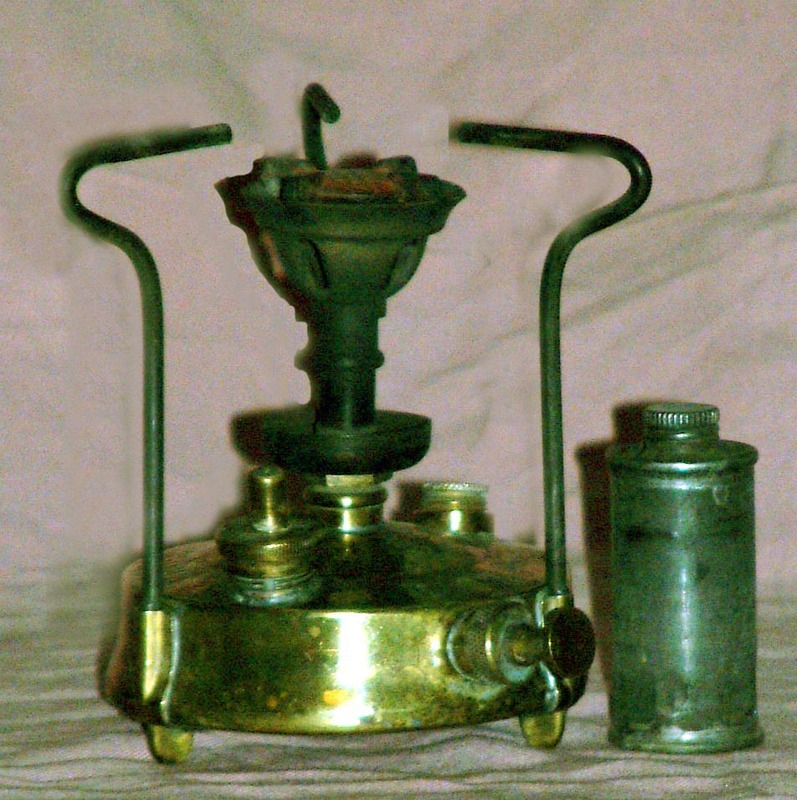 Features which identify this as an early model are the tin box design, 'knob' feet, pressure release on the filler cap and the 'parking place on the tank for the burner transport plug. It is interesting to compare the early 17b above to the 1950's model pictured here. The flame spreader is now a brass plate clipped onto the burner. Unseen in the picture the burner has two slots in the neck to prevent the head from jamming on the vapouriser. Patented by Monitor in 1951, jamming was a common problem with Primus and Optimus stoves. The filler cap now has an air release screw on the top and there are three folding legs to replace the 'knob' feet of the earlier style. The tin box has been modernised too. In bright yellow and red it shows a caravan, cyclist, motorcyclist and a car to emphasize the little stoves usefulness 'For Every outdoor occasion'. Copyright © 2004 Base Camp. All rights reserved.